A few weeks back I had a first look at littleBits Avengers Hero Inventor Kit, which was a great way for kids to learn how to create, customize, and code with Avengers Superheros. Now littleBits has released a line of three inventor kits so kids can build fun and playful STEAM (Science, Technology, Engineering, Art, and Math) inventions. Each of littleBits’ inventor kits comes with Bits, paper templates, accessories, a 9V battery, and a free inventor app equipped with in-app activities with step-by-step instructions and tutorials that guide kids through building and customizing fun inventions that help them unleash their creativity. littleBits believes kids have to “see it” to “be it” and the new Base Inventor Kit introduces kids to the stories and ideas of forward-thinking young inventors so they can get a better idea of what ingenuity looks like around the world. Designing solutions that protect and promote community wellbeing, help people with disabilities, and protect the planet, will teach kids how technology is built -- and encourage them to create their own inventions. 12+ activities in the free Inventor App guide kids through building fun inventions, like a voice-activated robotic gripper arm or a room-protecting intruder alarm. Kids are then challenged to create their own inventions to improve their room, help their community, or save the world. Kids learn about interesting and innovative ways they can make music happen through the stories of Banu Musa (inventor of the first guitar) and Imogen Heap. They’ll never look at music in the same way again. 12+ activities in the free Inventor App guide kids through building musical inventions, like an electric keytar or air drums, learning STEAM skills, and drawing inspiration from real-world musical inventors. Space is a powerful story that captures kids’ imagination and excitement and this kit gives them the information they need to delve deeper. 30+ activities in the free Inventor App guide kids through building and controlling space vehicle inventions, like a space rock collector or an alien life detector, learning STEAM skills, and drawing inspiration from real space pioneers. 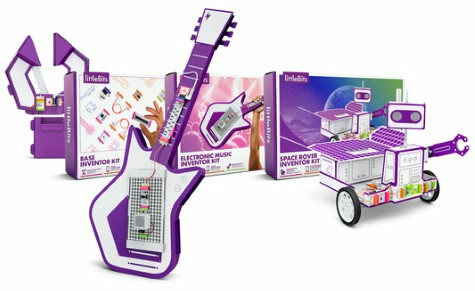 Along with the release of the Base Inventor Kit, Electronic Music Inventor Kit, and Space Rover Inventor Kit, littleBits will unveil supplementary online video content and tutorials on JAM.com, the largest paid subscription video course platform for kids. Complementary video courses on JAM.com will extend the invention process for each of the littleBits inventor kits, offering extra tips, stories, and demonstrations for young inventors. The Base Inventor Kit, Electronic Music Inventor Kit, and Space Rover Inventor Kit are fun on their own, or they can be combined and reconfigured to create brand-new inventions. They are available on Amazon and littleBits.com.